Black Rhino have been listed as critically endangered on World Wildlife Website. Human illegal activities like poaching have been main cause of Black Rhinos' declining population. Habitats changes have also effect their population decline. Many organizations like WWF, Save The Rhino, and others are fighting hard to protect rhinos from extinction. 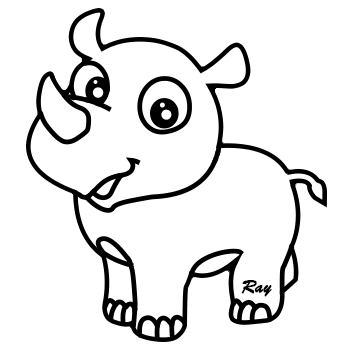 Ray, the Black Rhino lives with his small family in Africa. He loves to roam around looking for adventure as he gets summer all year round. With his horn, he could break apart almost anything on his way. However, he only eats vegetables as that his way to stay healthy and active. At Endanzoo, our cartoon artists keep coming up with the one-of-a-kind arts that would be simple, cute, and yet meaningful. Through these one-of-a-kind arts on the children’s organic clothing, we hope to convey an important message: SAVE SPECIES FROM EXTINCTION. Help save Rhinos with every purchase!